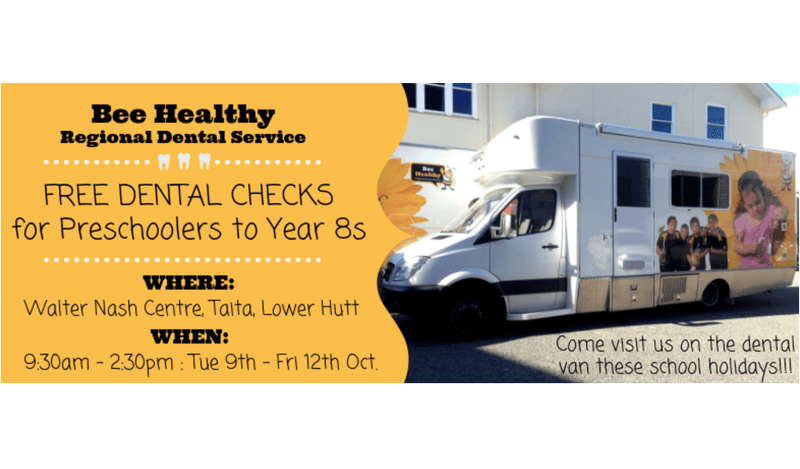 Bee Healthy Regional Dental Service will be at Walter Nash Centre, Taita, Lower Hutt, from Tuesday 9th to Friday 12th October between 9:30am and 2:30pm offering free drop-in dental checks* for Preschoolers to Year 8 children, that have not had a dental checkup this year. Parents, if you have concerns about their teeth, you can also bring them along and they can have their teeth checked as well. As this is a drop in service, dental checks will be provided on a first in, first seen basis. Checkups are 20 minutes per child. Please note during busy periods there may be a wait. *To be eligible for free dental checks, your child needs to be enrolled with Bee Healthy Regional Dental Service. If your child is not enrolled, call 0800 TALK TEETH (0800 825 583) to enrol them today. Bee Healthy also provide free dental checks by appointment for preschools at our Bee Healthy Dental Hubs, so if you are unable to make it to our drop-in van service, you can give us a call on 0800 TALK TEETH (0800 825 583) to book an appointment at your local Bee Healthy Dental Hubs.